The year's about to come to an end and I am sure all of you have some great things planned to spend the New Year's Eve! I love using facial oils and serums, I mean there was a time when I was reluctant to use oils on my face but when I did...... there was no looking back as these oils and serums have benefited my skin immensely. However, one thing must be noted that facial oils and serums are different. You may read more about the difference here. 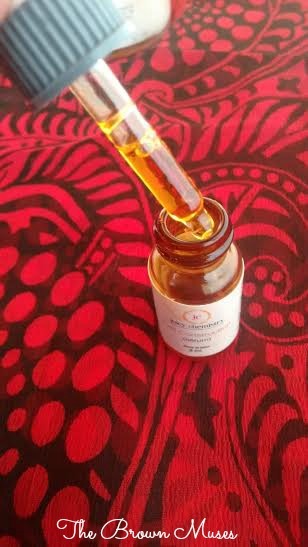 After my facial oil from Do Bandar finished (you may read the review here), I was on a look out for a serum that would actually deliver results. Came to my rescue was Juicy Chemistry's Cell Construction Serum which is currently one of the most sought after product among Indian beauty bloggers. Today, I will be sharing my experience with Cell Construction Serum and Anti-Ageing Lavender Honey Face Cream. Juicy Chemistry's Cell Construction Serum comes in a chromated glass bottle to protect the content inside and trust me, the bottle is very cute, The bottle also has an in-built dropper which allows you control over the amount of serum you want to retrieve. The labels on the bottle list the ingredients, manufacturing date, shelf life etc. I like simple packaging so no complains, however the brand has recently revamped their packaging and it's more colourful and pleasing to the eyes. The serum is dark golden brown in colour and is highly concentrated in nature, it has a nice herbal smell which fades within minutes of application. The serum gets absorbed by the skin very easily and it is not at all greasy. I use the serum every night without fail. Prior application, I wash my face with a clay based facial cleanser and tone it with an alcohol free toner. I take 3-4 drops of serum, rub it between my palms and press it all over my face followed by a very gentle massage. When used the daily, the bottle will last for around 2 months or so. I have been using this serum from last one month and I have noticed some great results. I use the serum along with anti-ageing lavender honey face cream. When used together, the serum and cream have faded acne marks, the darkness around the corners of my mouth has reduced considerably and I wake up with a glowing, soft and supple skin. I have also noticed that the combination of serum and cream have also helped my facial skin in achieving an even-skin tone. The serum stands true to every claim it makes however on the wrinkles/fine lines aspect, I don't have it hence I cannot comment on that claim. A patch test is highly recommended before use. I have yet to test the oil's potency individually which I will do hopefully in future and keep y'all updated. Shea Butter, Natural Vitamin-E, Sweet Almond Oil, Rosehip Essential Oil, Apricot Kernel Oil, Argan Oil, Pomegranate Oil, Wild Forest Honey, Carrot Seed Oil, Frankincense Essential Oil, Lavender Essential Oil, Sandalwood Essential Oil, Rosemary Essential Oil, Myrrh. The face cream comes in a plastic jar and with a screw lid and an inner disc to further protect the content inside. The packaging is simple, the jar has labels listing all the important details such as ingredient, manufacturing date, shelf life etc. The cream is yellow in colour and has a very thick consistency. It has a strong herbal aroma due to presence of essential oils. The smell lingers on the skin for a couple of minutes before vanishing completely. I think the relaxing aroma of the oils help me sleep better at night. I take twice the pea size amount and gently massage it all over my face. I use it post cleaning, toning and moisturising with the serum. Since the cream has a thick consistency, it is very heavy but not really greasy, I do not think this cream is suitable for oily skinned beauties as it will make their skin oilier. However, the cream is perfect for dry skinned beauties. My skin gets overly dry in winters so I am enjoying using the cream however it does take it it's own sweet time to absorb completely but having said that I apply the cream liberally and thankfully it has never broken me out. 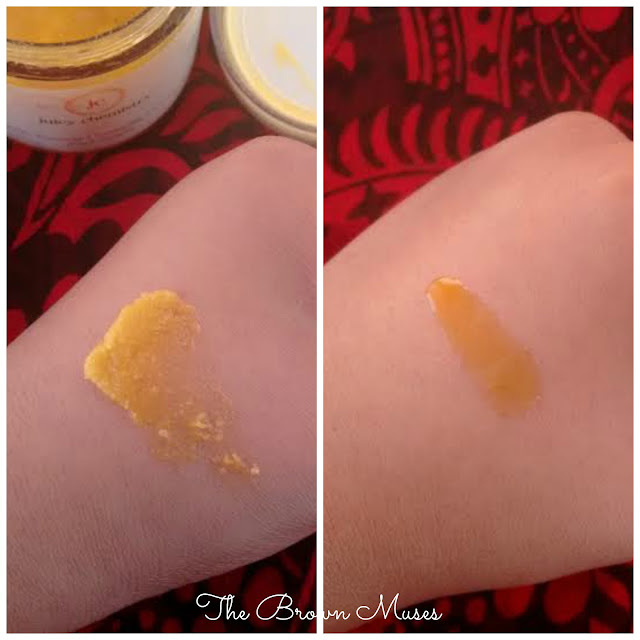 The cream gets it's moisturising properties from honey and shea butter. Due to it's heavy texture I don't think I will be able to use it in summers as my T-Zone gets very oily then. I have got the 75 gm jar which the brand has discontinued. The cream is now available in smaller quantities which is great. When used together with cell construction serum, my acne marks faded, the darkness around the corners of my mouth reduced considerably and I wake up with a glowing, soft and supple skin. I have also noticed that the combination of serum and cream have also helped my facial skin in achieving an even-skin tone. The cream stands true to every claim. A patch test is recommended before use. Handmade, natural and cruelty free. Cost effective - A little goes a long way. Fades acne marks, lightened pigmentation around the corners of my mouth. Makes the skin smooth, soft and renders a healthy glow. Evens out uneven skin tone. The cream has a heavy texture therefore it takes time to absorb. Cream is not not suitable for people with oily skin. 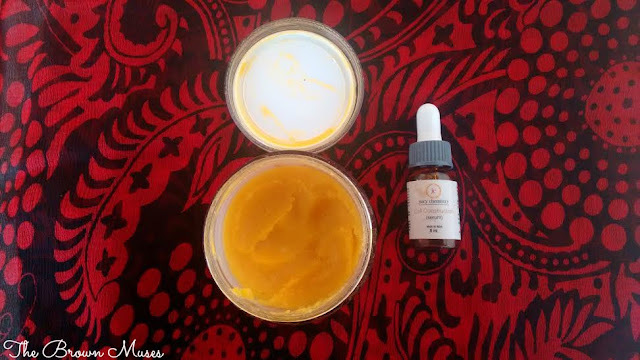 The serum is priced at INR 400 for 10 ml and the face cream: INR 350 for 35 gm (the product has been reformulated and is now known as Lavender, Myrrh & Wild Forest Honey Face Cream). The products can be purchased from brand's official website HERE. Yes I will! I mean who wouldn't want a soft and smooth skin with an even skin tone? If you are 25 or above, include natural and pure anti-ageing products in your skincare regimen now! 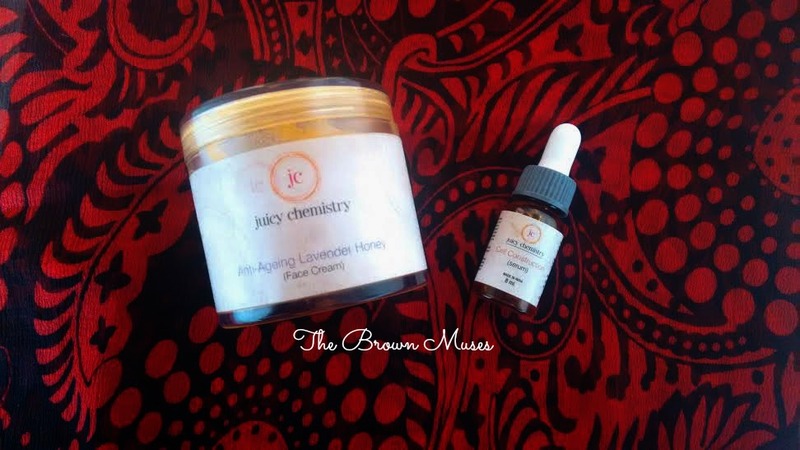 Have you used these two products from Juicy Chemistry? Do tell below! is the serum suitable for oily skin ?